Orchestra Hall has been the home of the Minnesota Orchestra since it was constructed in 1974. According to architects Hardy Holzman Pfeiffer Associates, it was designed to be “anti-monumental” to avoid the typical association between upper-class society and symphony orchestras. The façade was made of transparent glass and the lobby was fitted out in industrial chic — exposed steel beams and air conditioning ducts, simple factory-style lighting fixtures, and steel staircase railings. But the lobby was not large enough to hold the original capacity of the 2,500- seat hall. 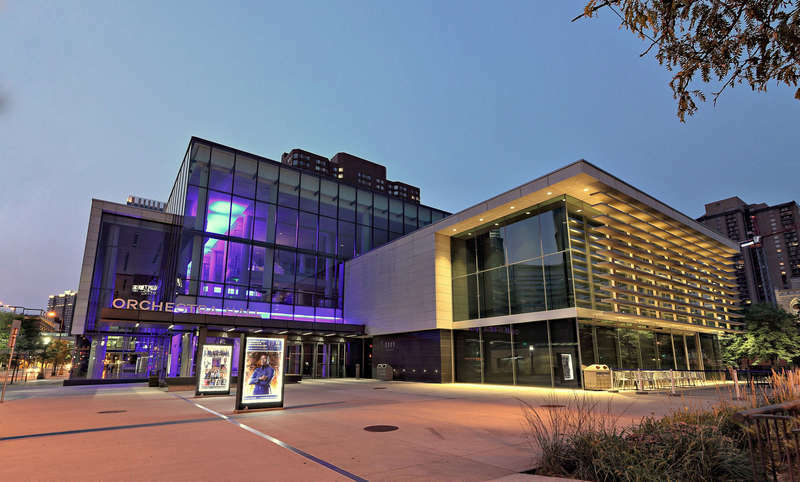 This problem was solved in 2013, when Marianne McKenna of KPMB Architects extended the lobby out into adjacent Peavey Plaza doubling its size and adding a second more intimate concert venue to the building. In contrast with the faux industrial lobby, the main auditorium was comfy and plush with warm brick walls and bright orange balconies and seat cushions. In the 2013 renovation, the orange seats were replaced by somber dark grey upholstery and the auditorium’s capacity was reduced slightly. This allowed for wider seats with more legroom and an additional cross-aisle for better circulation. Yet, the auditorium’s signature feature remains — dozens of huge cubes appear to emerge at random angles from the ceiling and the wall behind the stage. These cubes, a key element of the acoustical system designed by engineer Cyril Harris, deflect sound waves at random angles to avoid echoes. The resulting acoustics are superb and audiences never tire of gazing at the quirky geometry. Richard L. Kronick & Lisa Middag, “Orchestra Hall,” Minneapolis Historical, accessed April 18, 2019, http://minneapolishistorical.org/items/show/168.